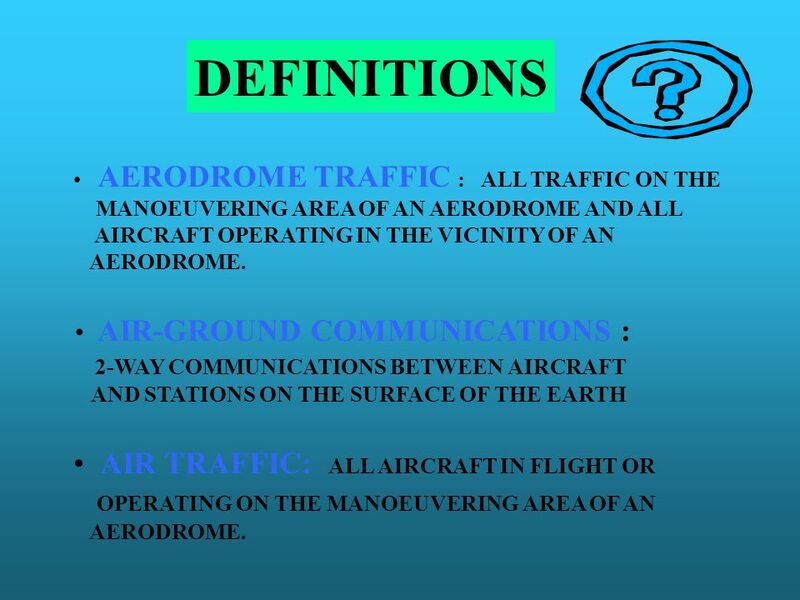 AERODROME TRAFFIC : ALL TRAFFIC ON THE MANOEUVERING AREA OF AN AERODROME AND ALL AIRCRAFT OPERATING IN THE VICINITY OF AN AERODROME. 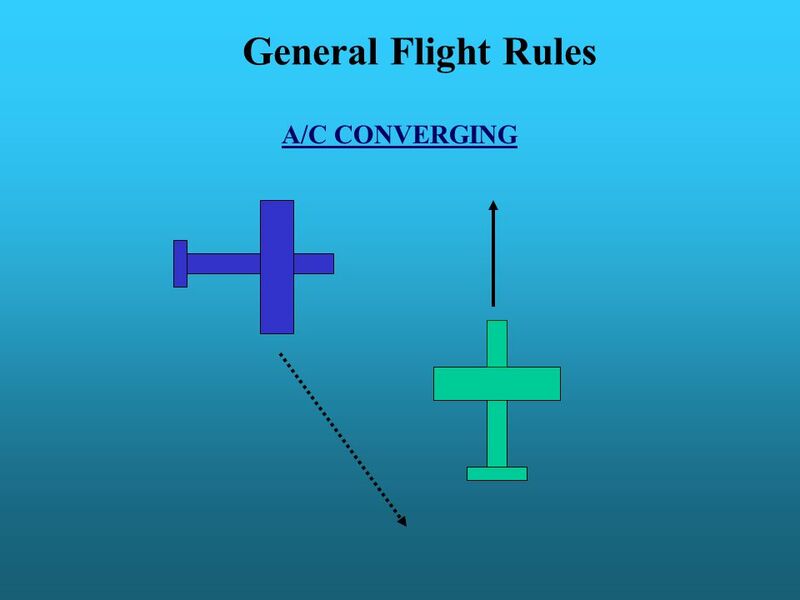 AIR-GROUND COMMUNICATIONS : 2-WAY COMMUNICATIONS BETWEEN AIRCRAFT AND STATIONS ON THE SURFACE OF THE EARTH AIR TRAFFIC: ALL AIRCRAFT IN FLIGHT OR OPERATING ON THE MANOEUVERING AREA OF AN AERODROME. 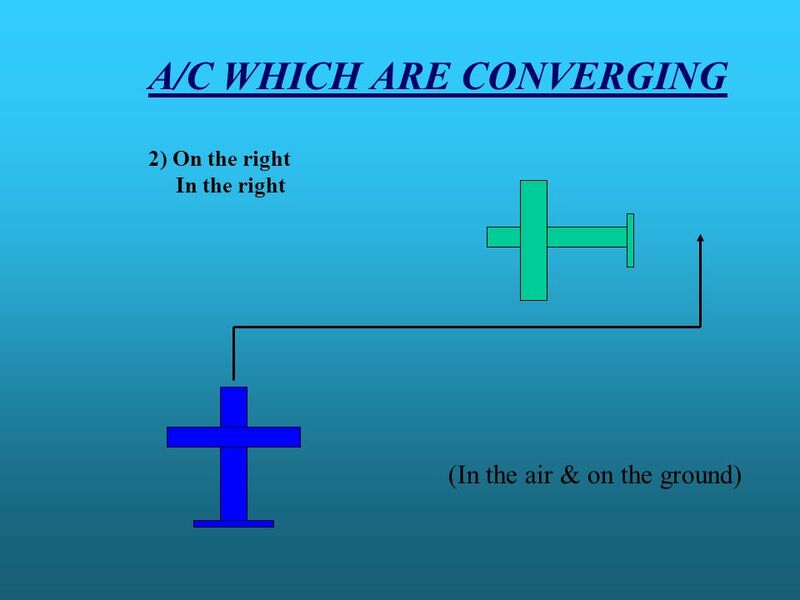 STATION TO ANOTHER IN CIRCUMSTANCES WHERE 2-WAY COMMUNICATION CANNOT BE ESTABLISHED BUT WHERE IT IS BELIEVED THAT THE CALLED STATION IS ABLE TO RECEIVE THE TRANSMISSION. 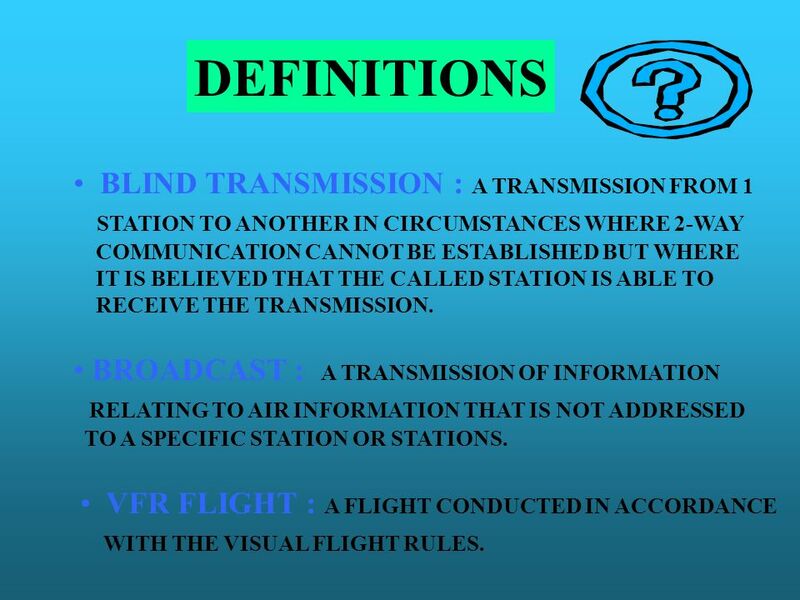 BROADCAST : A TRANSMISSION OF INFORMATION RELATING TO AIR INFORMATION THAT IS NOT ADDRESSED TO A SPECIFIC STATION OR STATIONS. 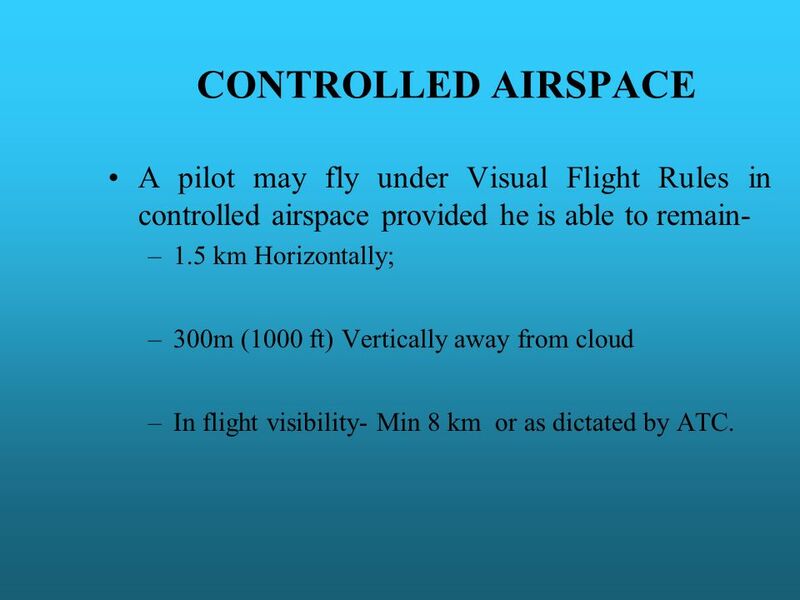 VFR FLIGHT : A FLIGHT CONDUCTED IN ACCORDANCE WITH THE VISUAL FLIGHT RULES. 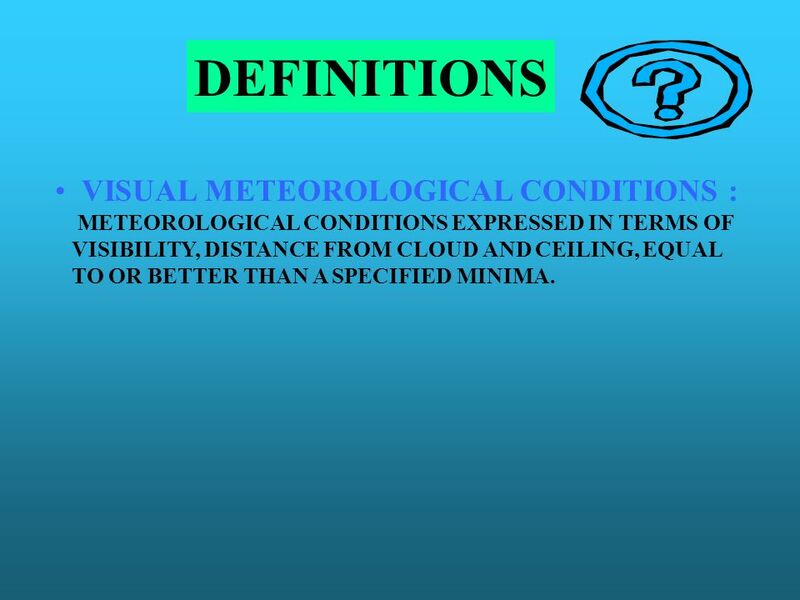 METEOROLOGICAL CONDITIONS EXPRESSED IN TERMS OF VISIBILITY, DISTANCE FROM CLOUD AND CEILING, EQUAL TO OR BETTER THAN A SPECIFIED MINIMA. 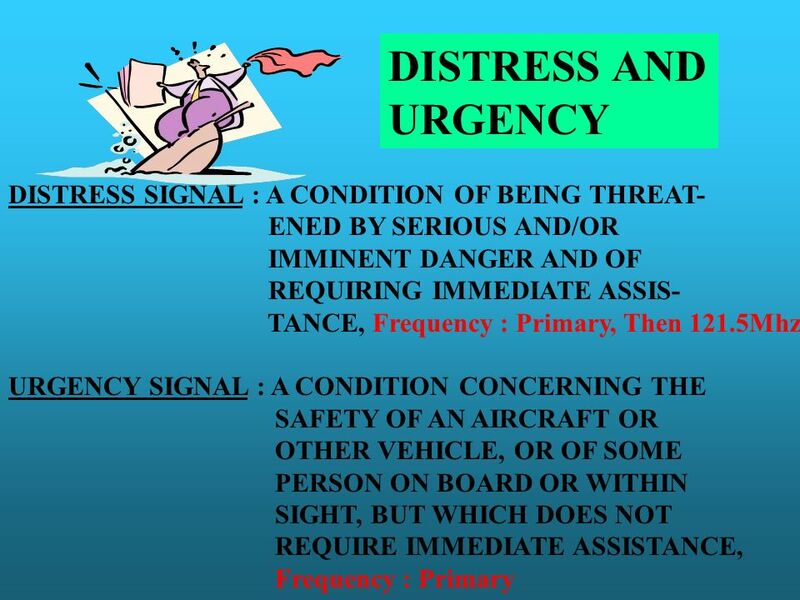 ATC : AIR TRAFFIC CONTROL ( IN GENERAL ) ETA : ESTIMATED TIME OF ARRIVAL ETD : ??? 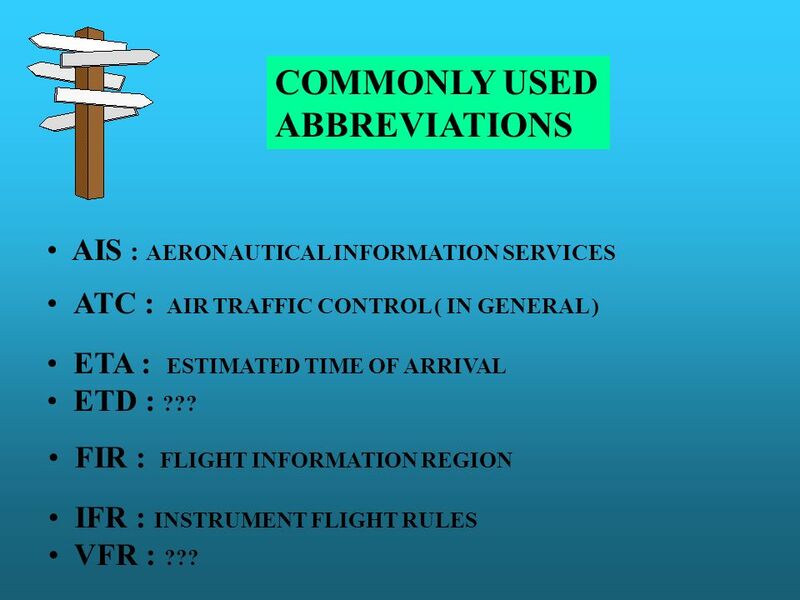 FIR : FLIGHT INFORMATION REGION IFR : INSTRUMENT FLIGHT RULES VFR : ??? CANCEL ANNUL THE PREVIOUSLY TRANS- MITTED MESSAGE CHECK EXAMINE A SYSTEM OR PROCEDURE CLEARED AUTHORISED TO PROCEED UNDER THE CONDITIONS SPECIFIED CONFIRM HAVE I CORRECTLY RECEIVED THE FOLLOWING…..? 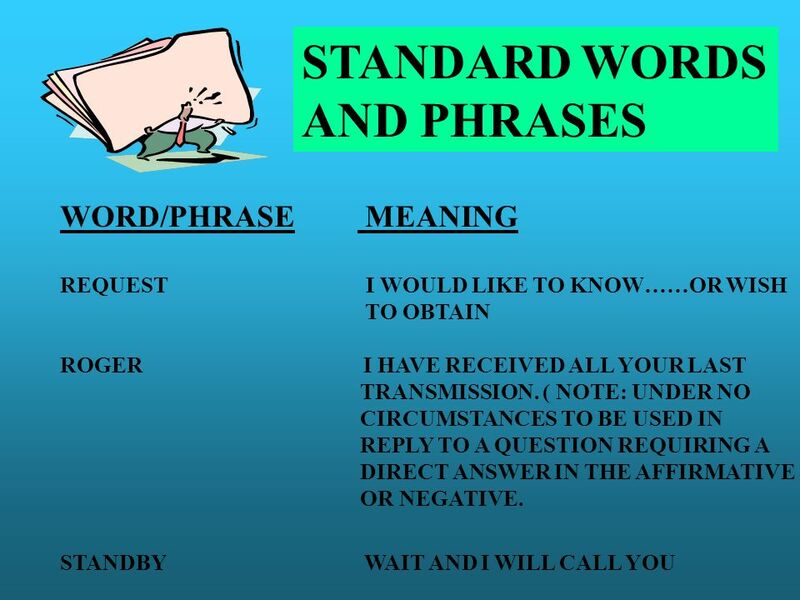 or DID YOU CORRECTLY RECEIVE THIS MESSAGE? 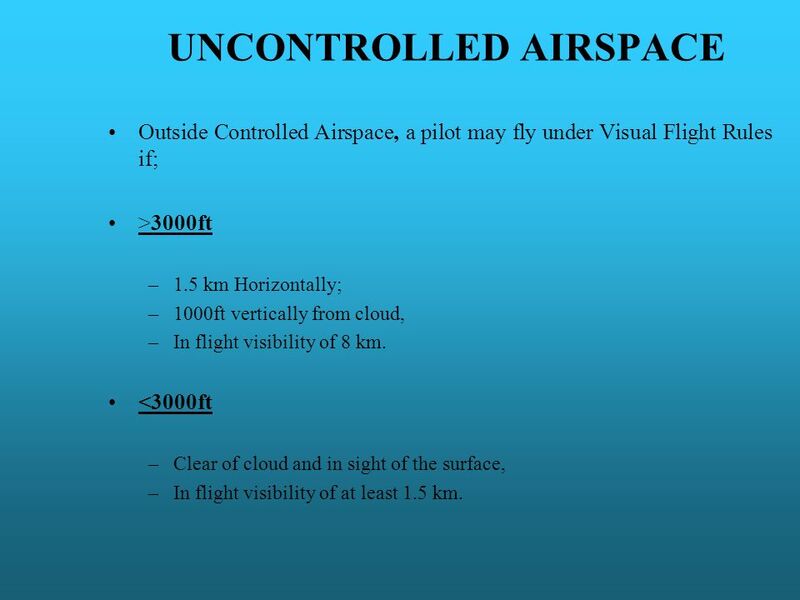 24 CONTROLLED AIRSPACE A pilot may fly under Visual Flight Rules in controlled airspace provided he is able to remain- 1.5 km Horizontally; 300m (1000 ft) Vertically away from cloud In flight visibility- Min 8 km or as dictated by ATC. 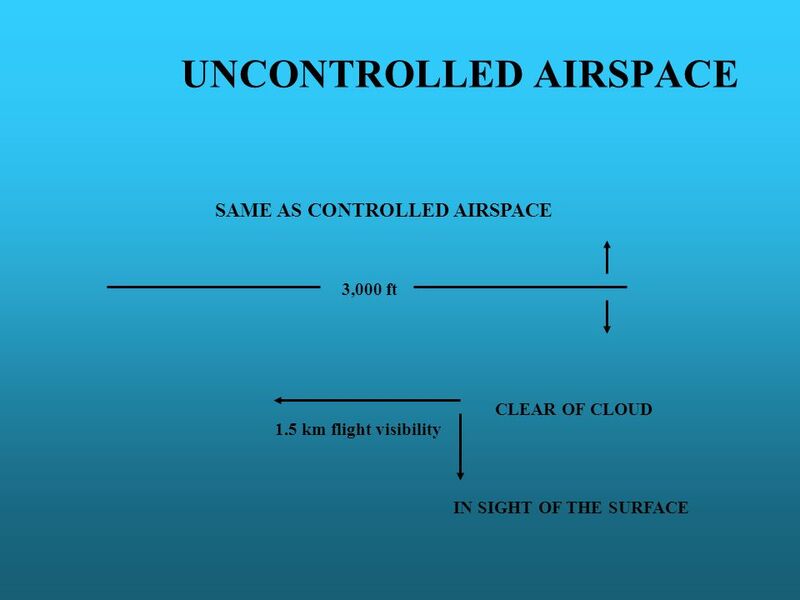 Outside Controlled Airspace, a pilot may fly under Visual Flight Rules if; >3000ft 1.5 km Horizontally; 1000ft vertically from cloud, In flight visibility of 8 km. 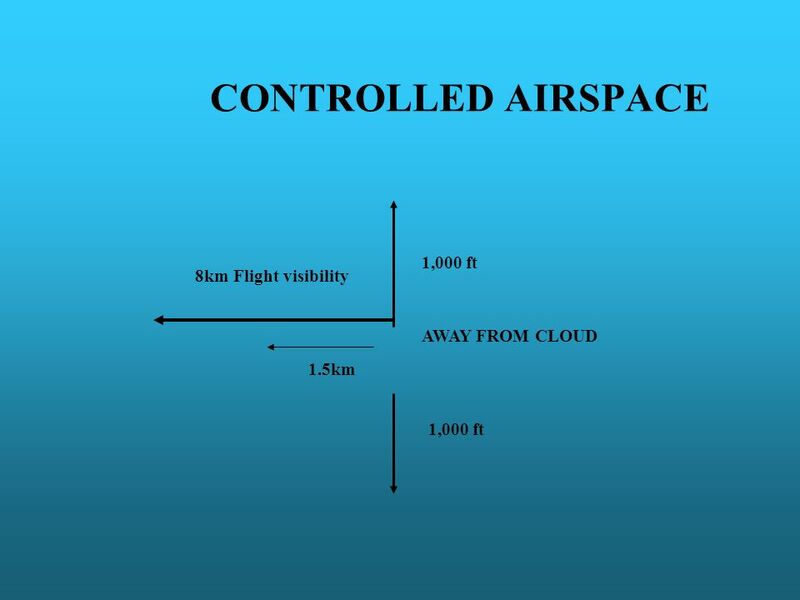 <3000ft Clear of cloud and in sight of the surface, In flight visibility of at least 1.5 km. 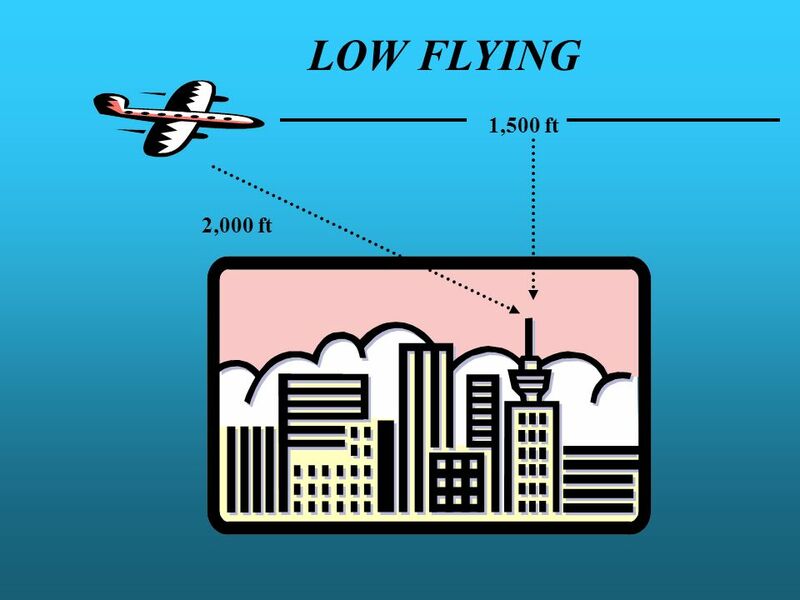 The vertical distance of a level, point or object considered as a point, from mean sea level. 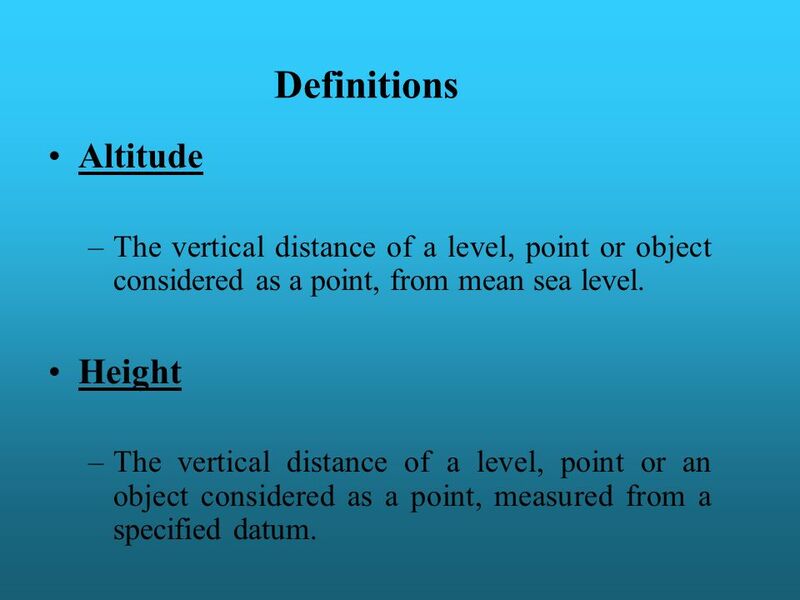 Height The vertical distance of a level, point or an object considered as a point, measured from a specified datum. 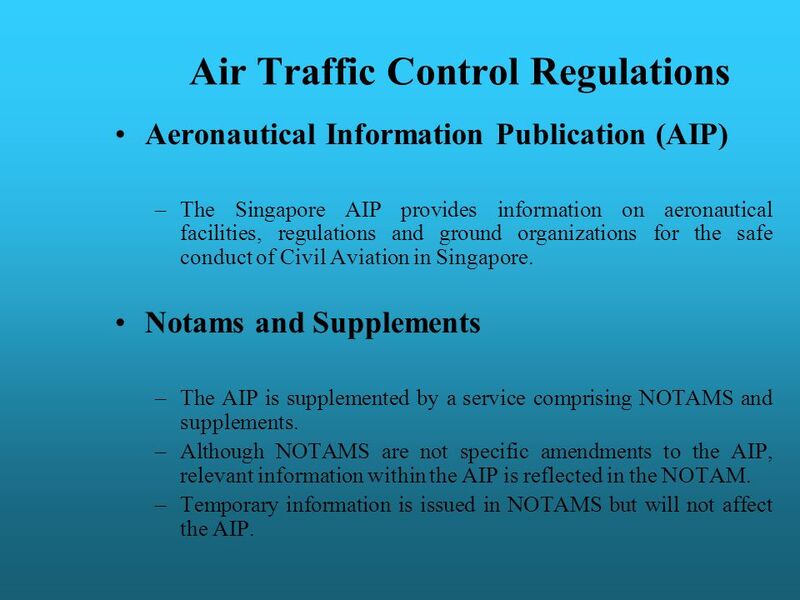 Aeronautical Information Publication (AIP) The Singapore AIP provides information on aeronautical facilities, regulations and ground organizations for the safe conduct of Civil Aviation in Singapore. 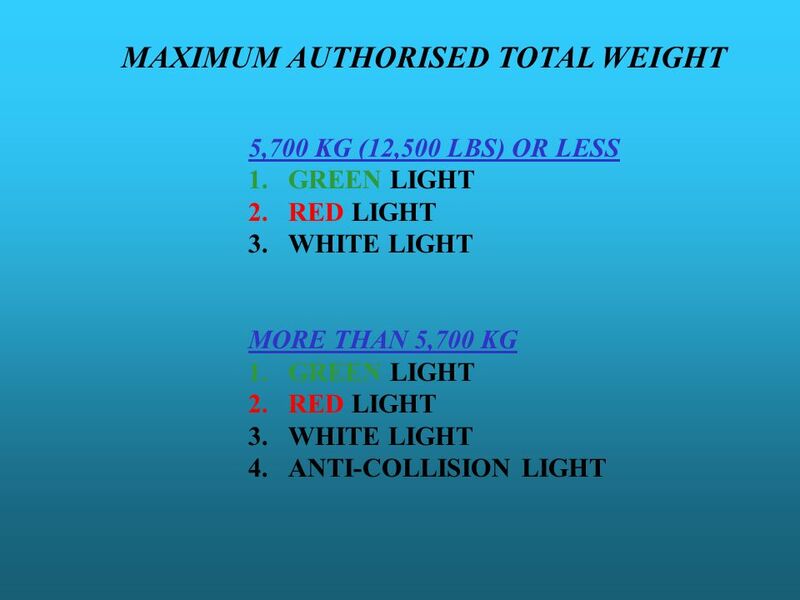 Notams and Supplements The AIP is supplemented by a service comprising NOTAMS and supplements. 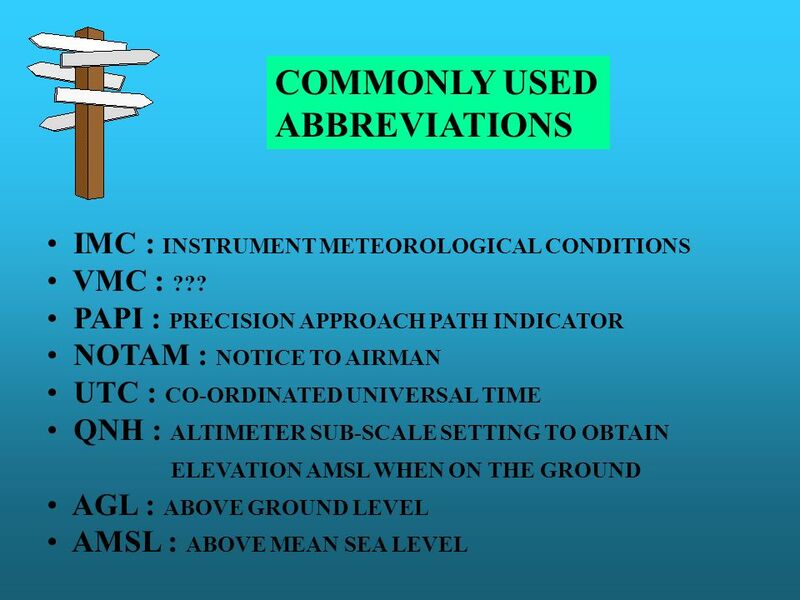 Although NOTAMS are not specific amendments to the AIP, relevant information within the AIP is reflected in the NOTAM. 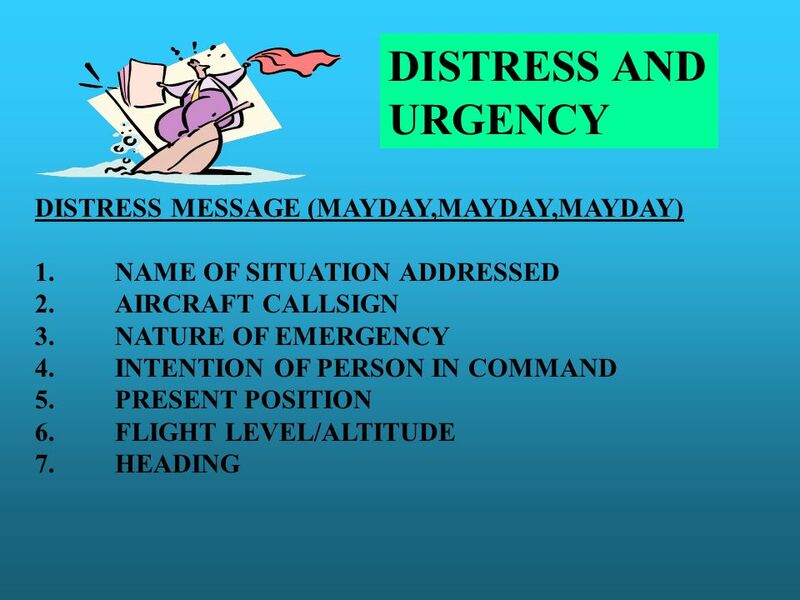 Temporary information is issued in NOTAMS but will not affect the AIP. 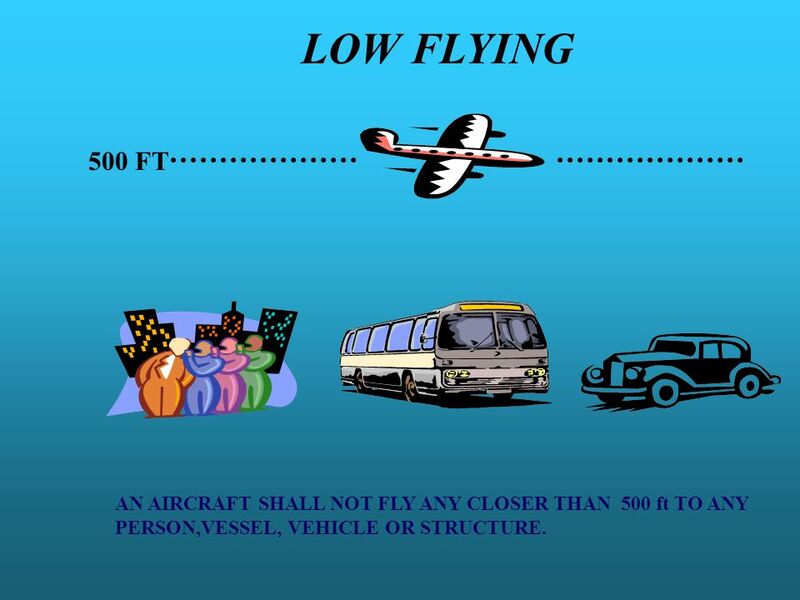 39 LOW FLYING 500 FT AN AIRCRAFT SHALL NOT FLY ANY CLOSER THAN 500 ft TO ANY PERSON,VESSEL, VEHICLE OR STRUCTURE. 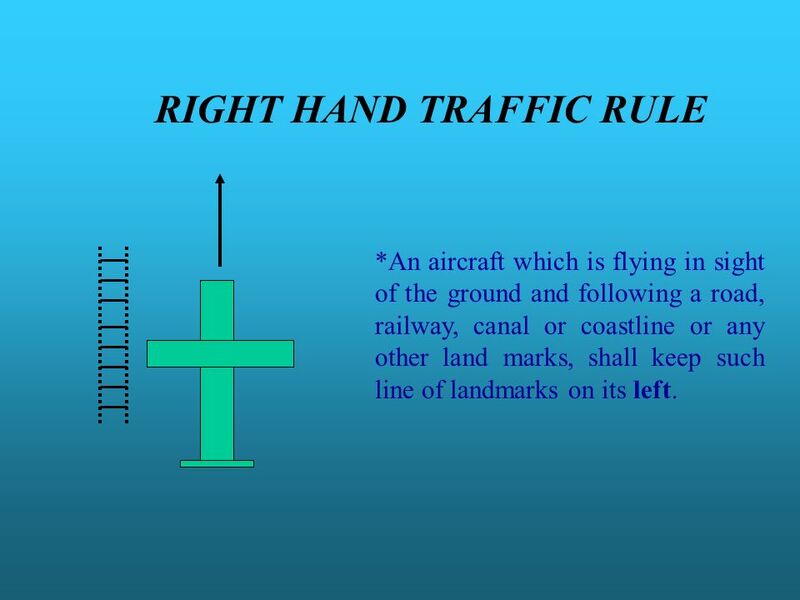 *An aircraft which is flying in sight of the ground and following a road, railway, canal or coastline or any other land marks, shall keep such line of landmarks on its left. 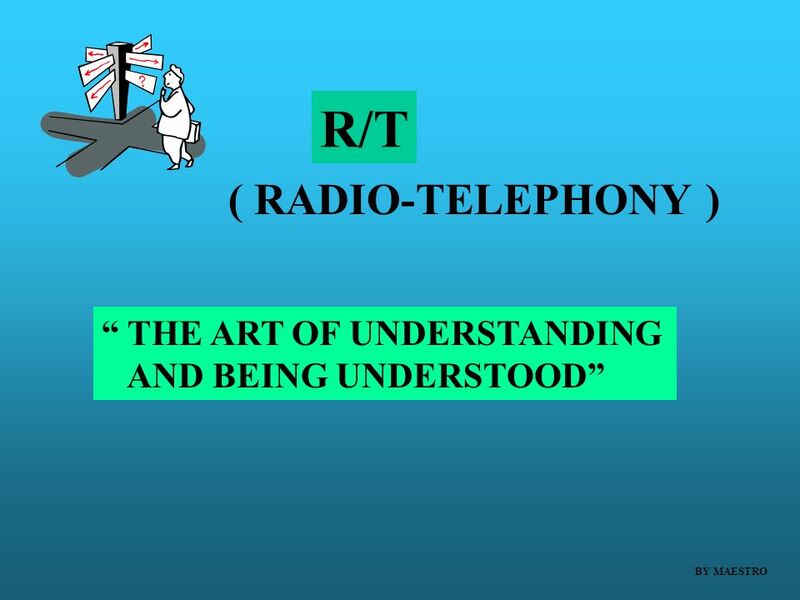 Download ppt "R/T ( RADIO-TELEPHONY ) “ THE ART OF UNDERSTANDING"
SCHUTZ & HILFE voice procedures Leadership Training « ATTACK » - Internet Distributed Learning in Advance. 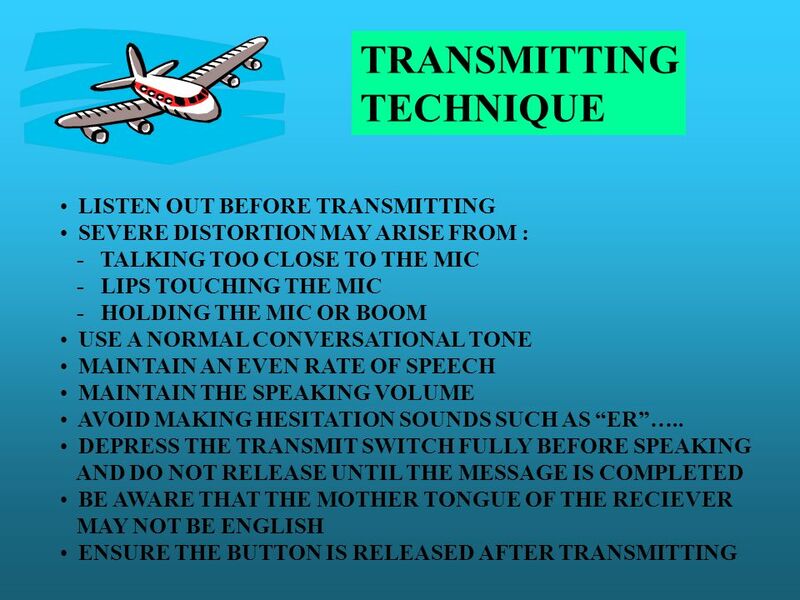 Stanley Friedman SO-CM-8 D5NR Member Training 2010 COMMUNICATIONS. 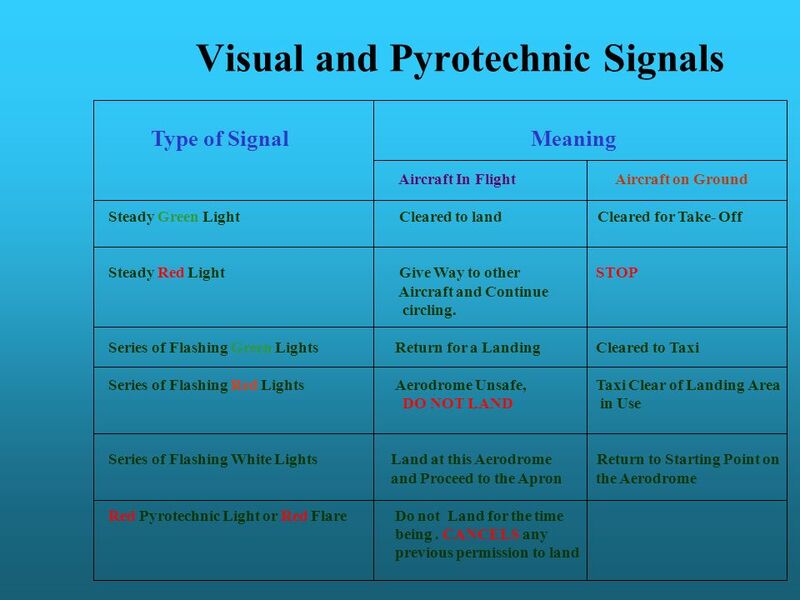 USNSCC Signal Flags Prepared By: Cadet J. Peterson Harlan R. Dickson Division USNSCC Manchester, New Hampshire. 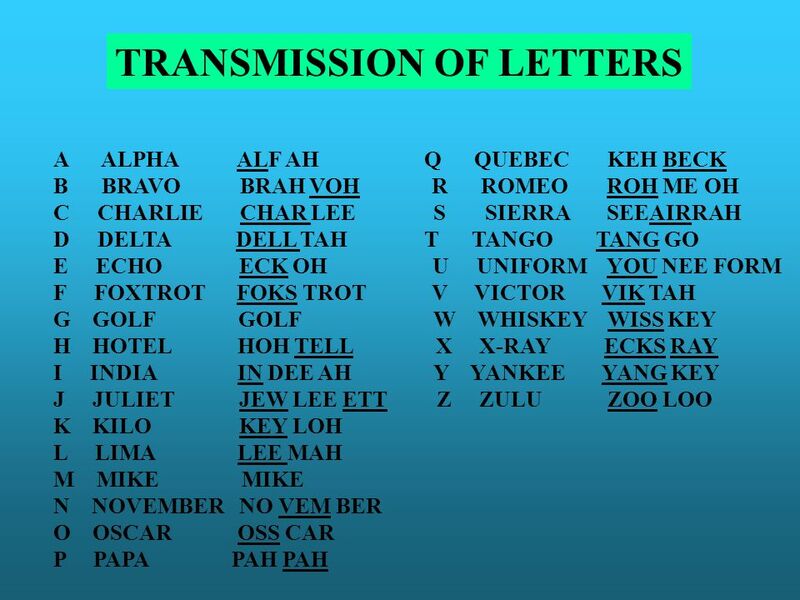 Regional Gliding School Phonetic Alphabet AAlfaJJulietSSierra BBravoKKiloTTango CCharlieLLimaUUniform DDeltaMMikeVVictor EEchoNNovemberWWhiskey FFoxtrotOOscarXX-ray. 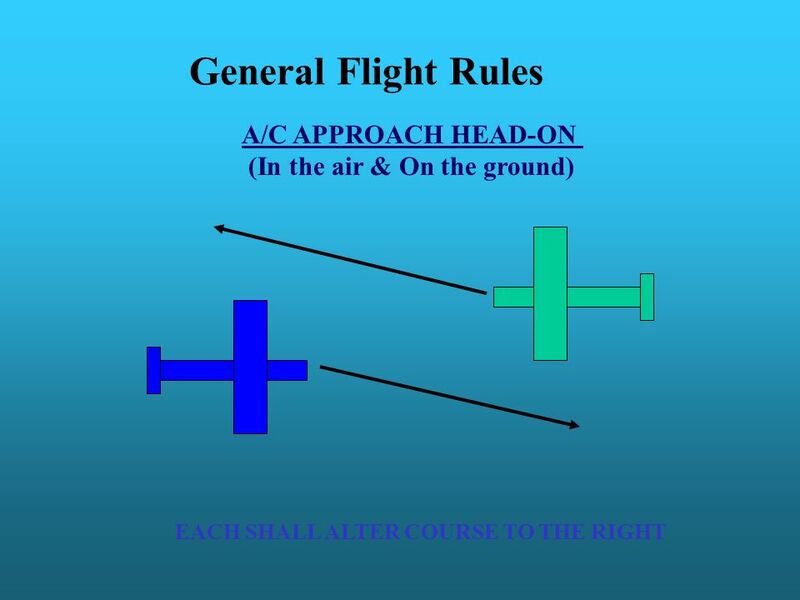 Chapter 2 Radio Procedures Part 1. 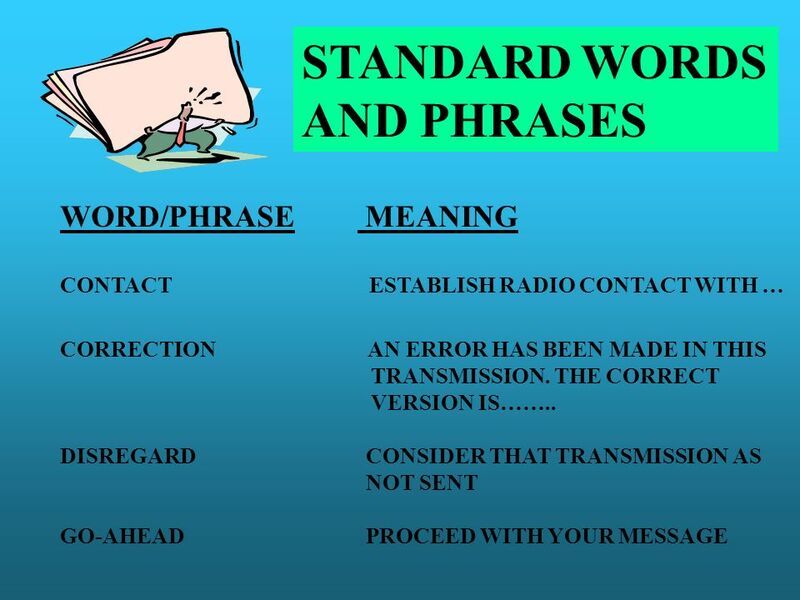 Radio Procedures SAD ECURITY CCURACY ISCIPLINE. Part 3. 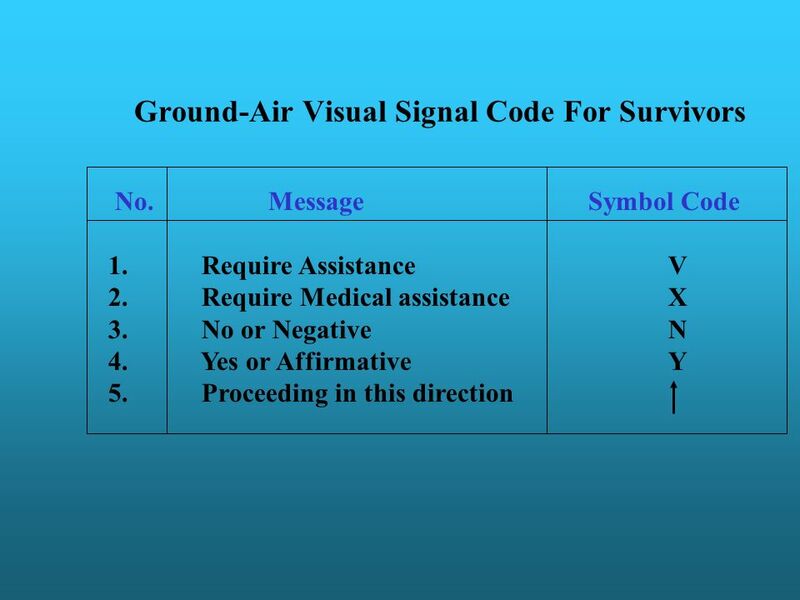 Air-ground communications July 1917 COMMUNICATION METHODS Air-Ground Communication (Definition) two-way communication between aircraft and stations. 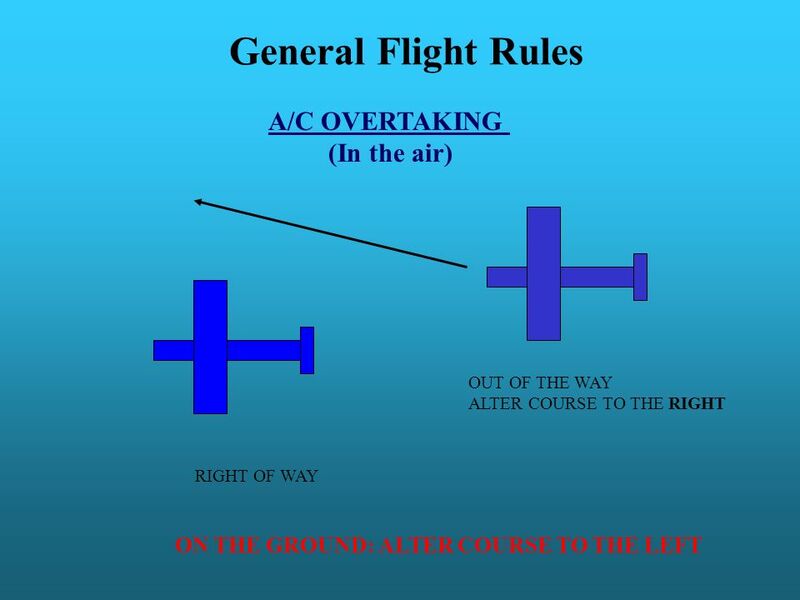 Radio frequency use in uncontrolled airspace Flight Instructor Seminars August 2013. 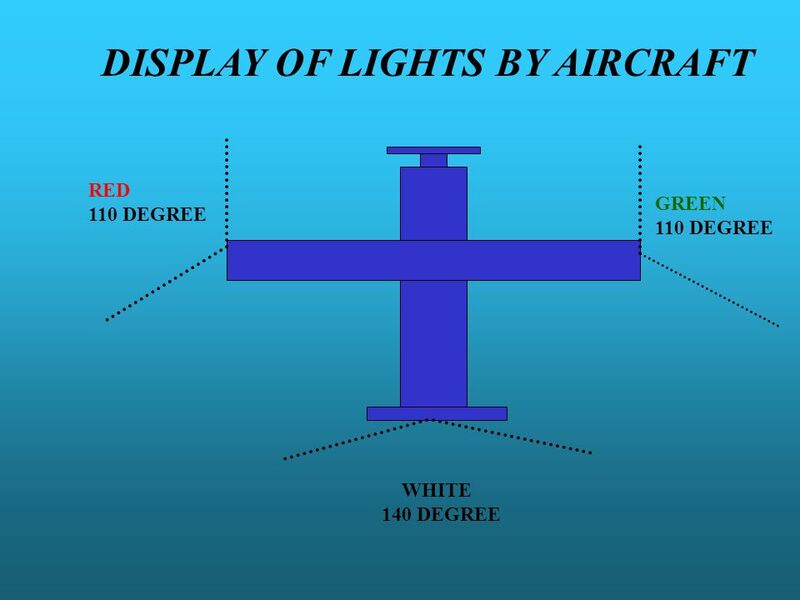 Regional Gliding School Wavelength Wavelength is the linear measurement of a wave. Communications. - Communication is a big part of everyday life - We communicate most effectively by using both aural and visual communication - When it. 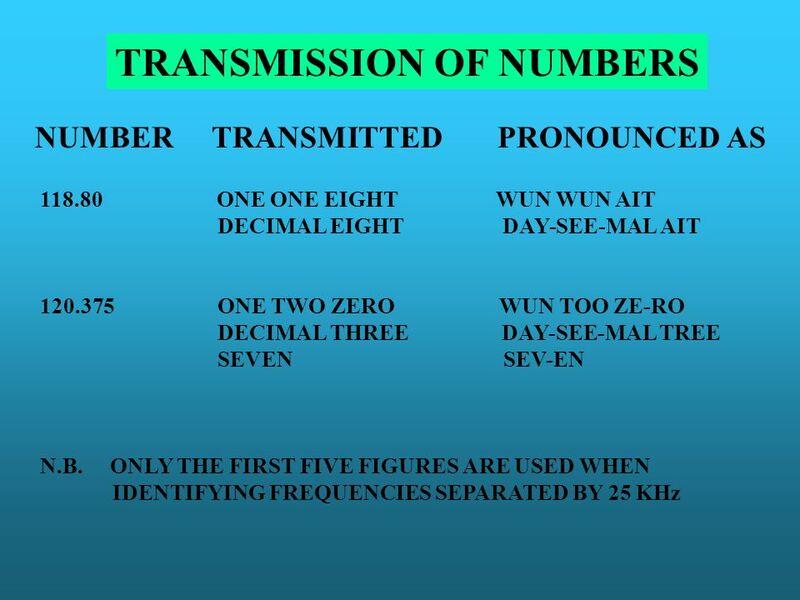 OPERATING IN AN AMATEUR RADIO NET Good operators are made, not born! 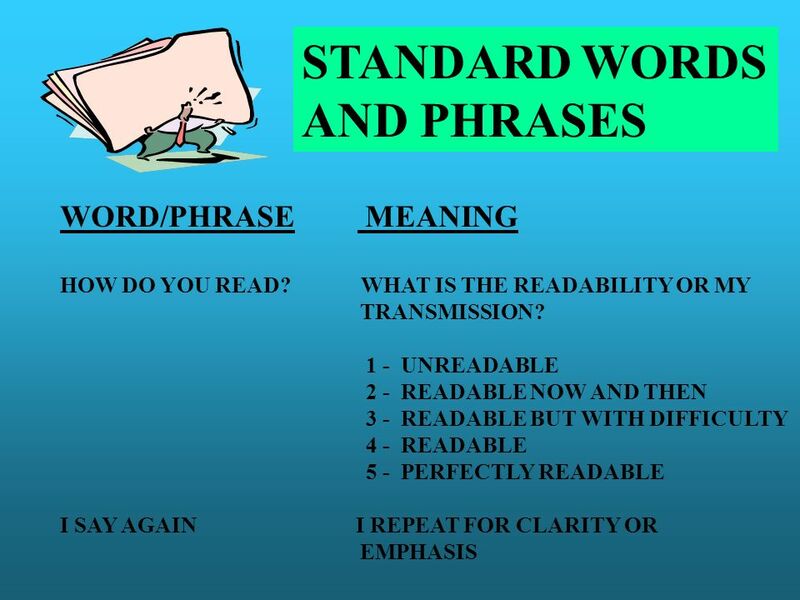 PROWORDS Prowords are a special set of words used for clarity and brevity in communications. 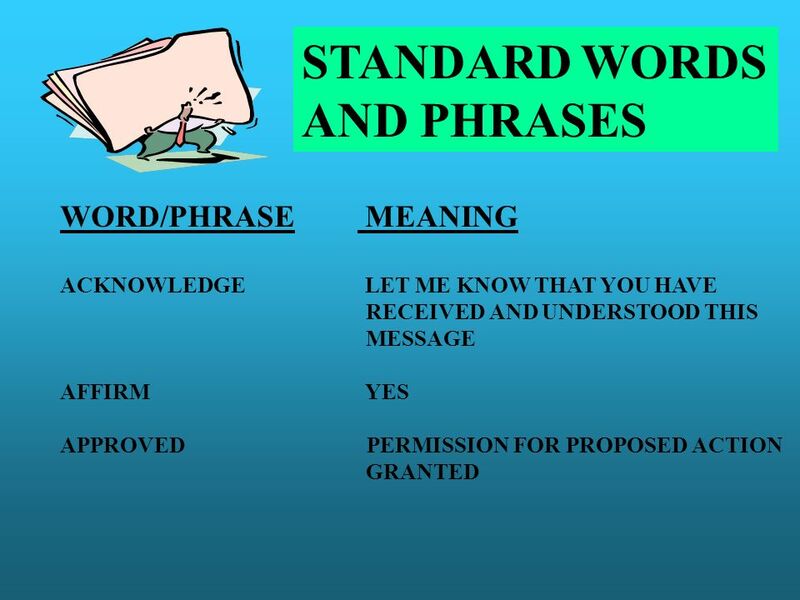 Most commonly used prowords are: AFFIRMATIVE Yes. AVAILABLE. 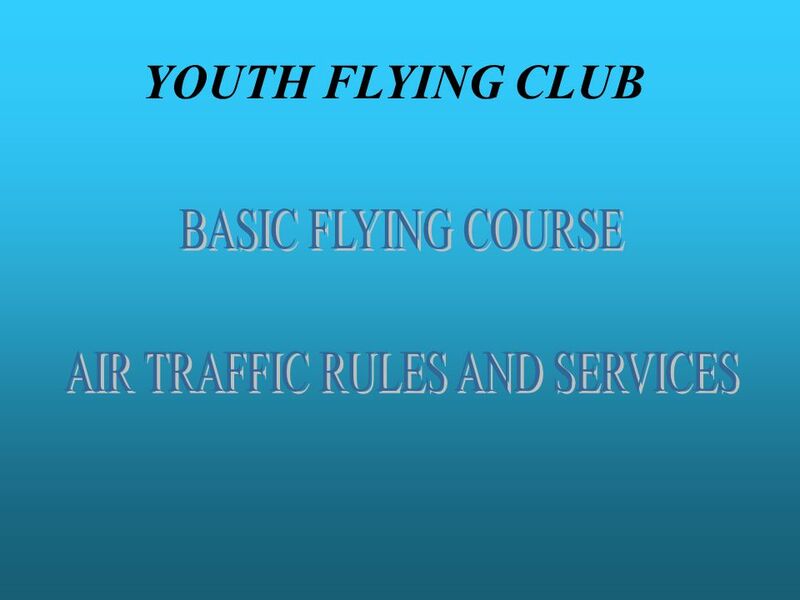 Bronze Theory Radio Telephony January Licences You must hold licence for the radio installed in your glider. 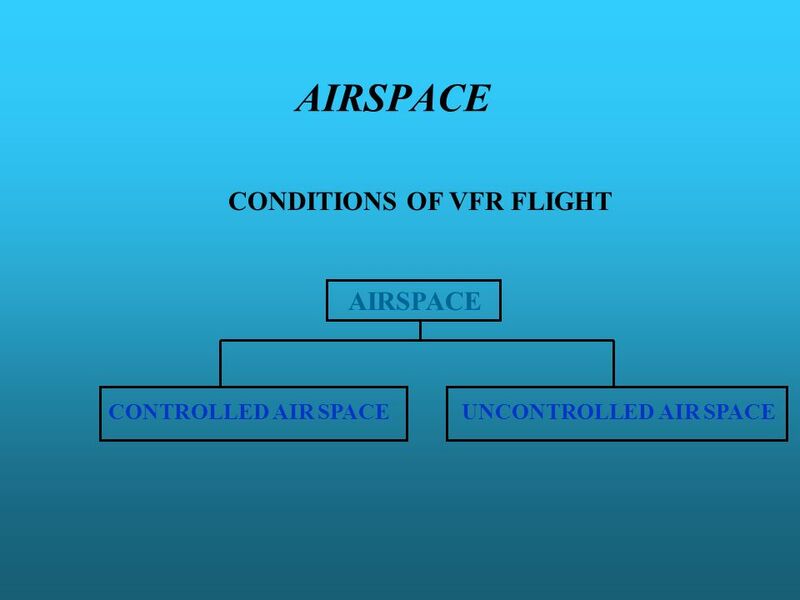 You must hold a licence for an air-band. 222 Sqn Comms Training Phonetic Alphabet Self Test Select Button to Start. 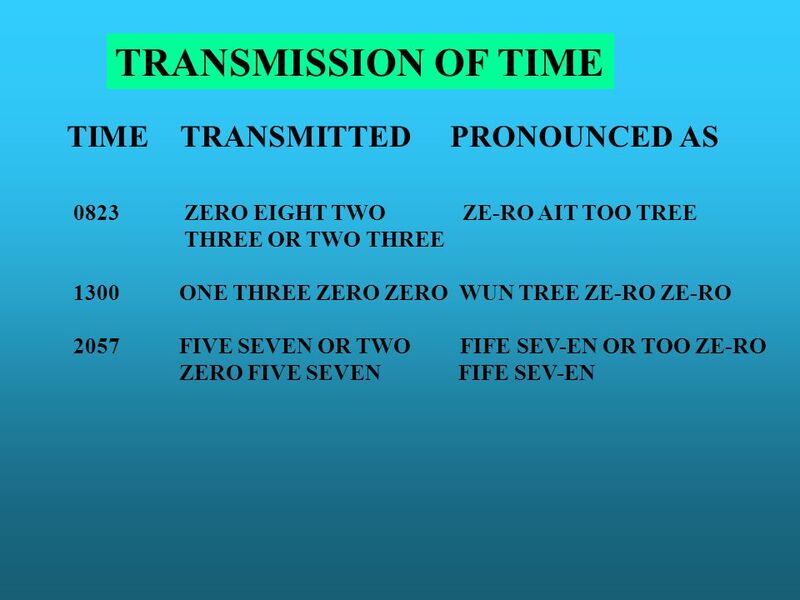 Radio Communications MTP’s 1.History of Communications and Intelligence 2.Phonetic Alphabet 3.Call Signs 4.Voice procedure. 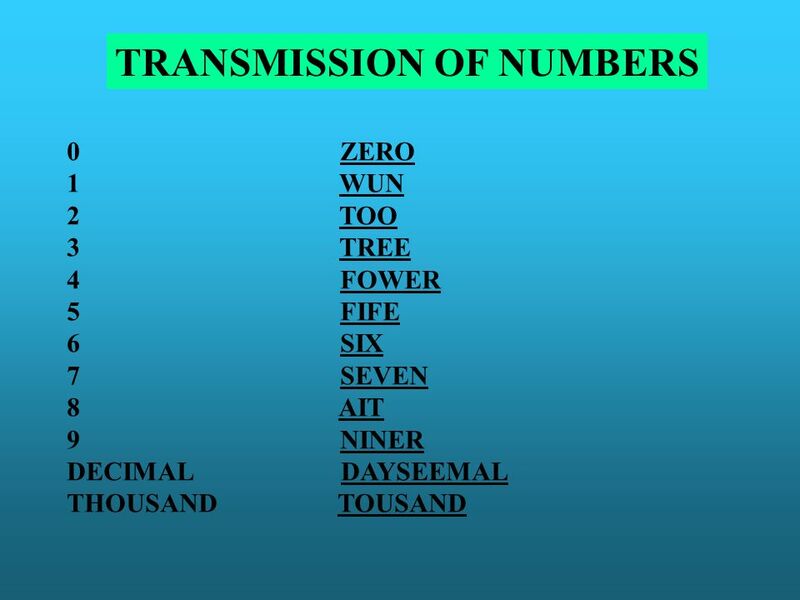 11 © Chris Snuggs27 March, 2012 Self-testing Practice – The International Alphabet.